UPDATE: We had to move the Suet basket away from our hummingbird feeders. There were so many sparrows at the suet basket, the hummers were scared away. On Wednesday my girlfriend Patty came over and brought me a suet feeder so I would get a blue bird to come to my yard. I love blue birds, but haven’t had many in our yard over the years. 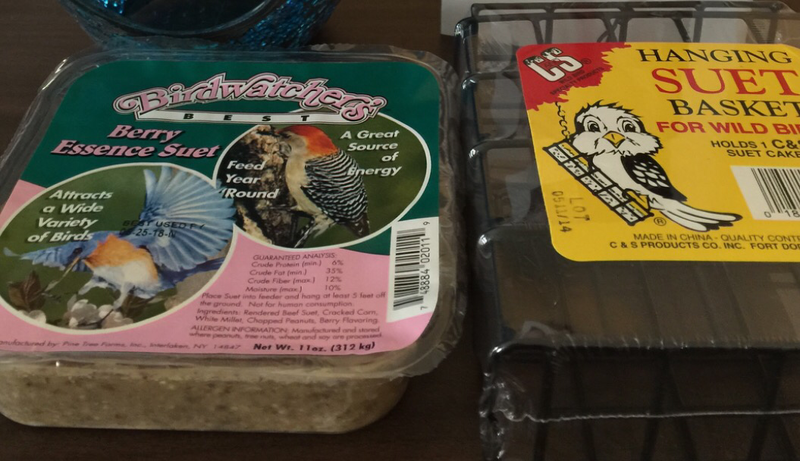 On the outside of the suet package there was a blue bird, so Patty said she was sure this would bring me a blue bird. My wonderful husband hung it outside the living room window, so I can watch it as I lay in my hospital bed recovering from back surgery. Since being hung outside, there has not been one bird, let alone a blue bird that has come to the suet feeder, but I guess it takes awhile. Update: 8/8/15 Today a Cardinal came to the Suet basket! We are blessed to attend a church in our community that has many ministries, one of which provides meals to parishioners that need them. Since I can’t stand at the stove to cook, we have meals delivered three times a week, which is a true blessing. Patty was here on Wednesday, Joe hung the suet feeder on Thursday morning. That evening we had a meal delivered, and the friend who brought the meal has a 5 year old son, Thomas. Their family is so awesome, they pray for many, and I am blessed to be on their prayer list. Now Thomas doesn’t know me, but he has been asking his mom, “how is the lady with the back surgery?” His mom would tell him that I am doing good, then he would ask her more questions about me, like what do I like to do. She told him that I love my flower garden. He told his mom that he was going to make me a gift for her to deliver to me that evening when she delivered the meal. For a 5 and a half year old he is amazing at origami! So when I saw his gift I was so impressed, and it gave me the goosies as well. 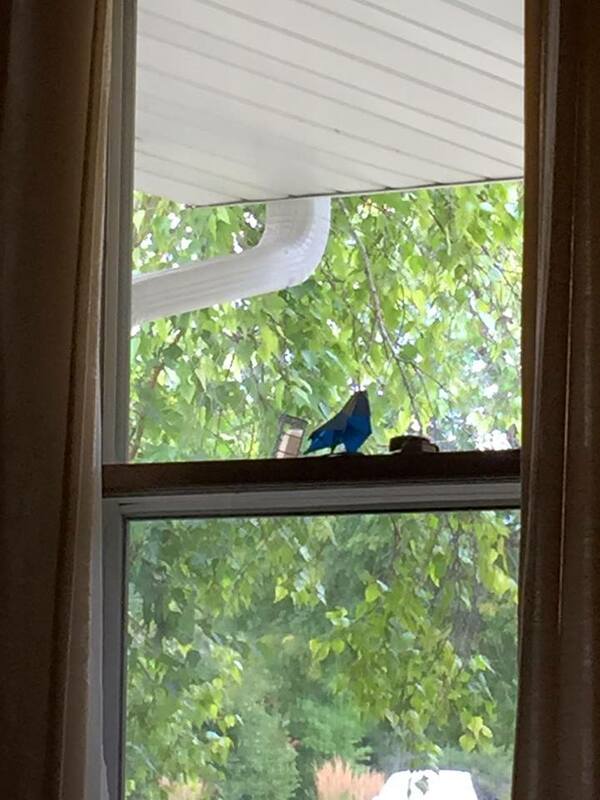 I took my friend, Thomas’s mom, over to the window to show her the suet feeder and I told her the story about how my friend Patty told me that if I hung the feeder, a blue bird would come! She just didn’t know at the time how it would come! 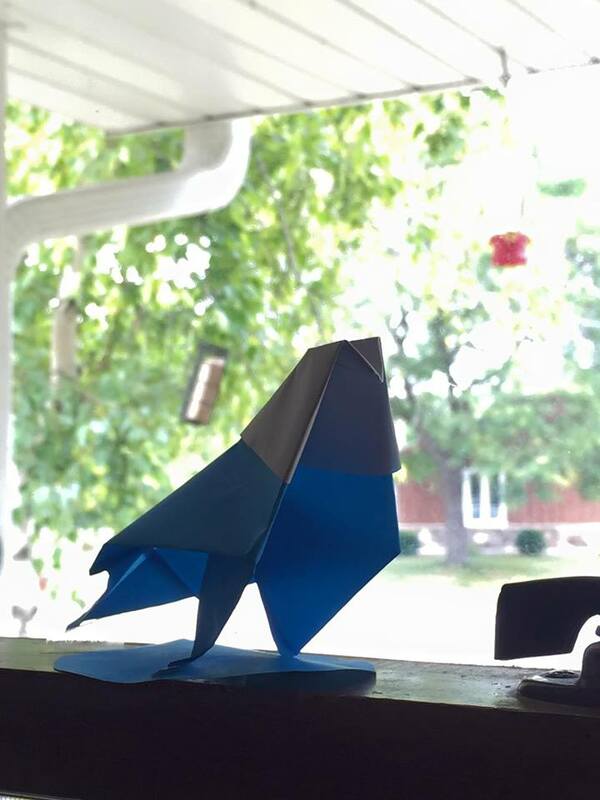 Here is my BEAUTIFUL BLUE origami BIRD that Thomas made for me. 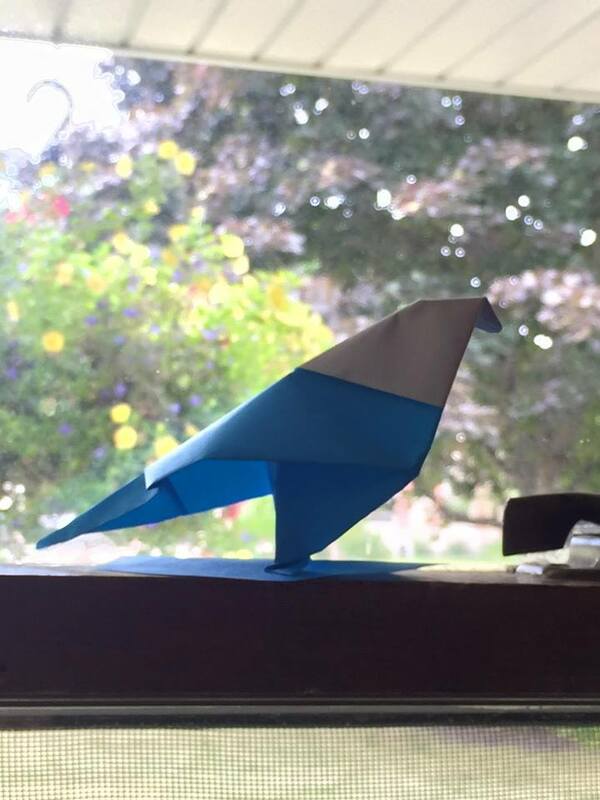 I was expecting to see a real live blue bird out my window, and instead my heart is overjoyed with love from my little origami bluebird that is now sitting on my window sill! It means more to me than a flock of real bluebirds! Thank you Thomas for your wonderful gift! What a beautiful blue bird from a very thoughtful boy! That does give you goosies, doesn’t it?